A record of all the updates so you can keep track of changes since your last visit. Updated to draft 3.8.3 following lots of thought and playtesting ! - unit selection restriction relaxed. Army must now include a Siren or Mermaid to include Crest Riders. Numbers of Crest Rider units were previously restricted to spellcaster's magic level. - reduced effective distance from 18" to 12"
* during play testing we could find lots of reasons to take the Millenial Fathom as the Army Standard in preference to The Tsunami Wave so I decided to narrow the points gap between the two. - a unit of Weresharks lead into battle by Zharc counts as a special unit choice rather than a rare unit choice. - increased cost from 200 to 210pts. - added a weapon that has a negative effect on enemy leadership when it causes unsaved wounds. * I could see very little reason for a Nautican commander to select this armour at such a high points cost. It can be valuable in certain situations but manufacturing those situations will not always be easy given the absence of a fast moving flying mount. - reduced cost from 55 to 45pts, reduced magic resistance from 2 to 1. * I thought this spell might become too "annoying" for the enemy so I reduced it's effectiveness but increased it's bound power to make the enemy question whether they will try to block it. - The Nautican Speargun (the superior cousin of the Fisher Speargun) is now only available to character models (following the removal of the Deep Diver unit) and has been increased from 3 to str4. - reduced targeting range from 24" to 18"
- spell has been rewritten to effectively drown those encumbered by armour or thick scaly skin and to render useless some machinery of war. - casting cost increased from 12 to 13. * I'm expecting to receive some criticism about this spell because it can, in certain situations, be quite devastating. Eg. if there are 3 units of Knights approaching one behind the other and the Tidal Wave hits all 3. However, I think on balance the enemy will soon learn to avoid positioning themselves thus and approach with more care ! The spell is costly against less armoured enemies. I have lessened the likelihood of it being misused by modifying the can be cast into combat rule. 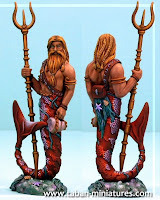 - Arrival of Coral Hunters, Crest Riders, Zu-Xhi the sprat Hero and Stingrays as a Core Unit has superseded the need for a fast moving character. Also, no suitable models found of the right size. Characters Page re-organised and links renewed. Added Aqualops & Seaweedlings, removed retired units and moved Stingrays into Core. * I wanted something a bit quirky and random making it's selection questionable but sometimes suprisingly useful and influential. New section added to show "Retired Ideas". - added MR1 to suit magically bound "fluff"
* in preparation for removal of Deep Diver skirmishing unit. Zharc emerges as his true self (a Wereshark) the father of weresharks ! Clarification of parry rule - now whole unit must choose to parry or not parry before each combat round. Loads of changes to the text, mainly minor. Some for rule clarification, some spelling/grammar corrections. Interceptors - simplified rules explanation, does not change actual rules. * this actually makes the orb significantly more "selectable" in an army list. Did not change points cost - pending feedback. In the final analysis, it can not actually do any damage to the enemy, only bluff them into actions they might not otherwise take. Guardian of Time - can use his Throttle attack against any size of enemy opponent. Added new artwork from Gareth Pannan: Interceptor, a Tripoon Battery harpoon, A Royal Nautican Chariot (character mount), Vortex (Special Character). Thanks Gareth ! Tide Watchers - changed net tangling effects. Increased effectiveness and risk of a bad cast. Sandgangers - clarified rules, allowing a sandgangers to choose which enemy to "emulate" at the beginning of each combat phase. This makes them more flexible and useful for the tactically astute. Interceptors - increased from 11 to 12 pts (including upgrade or interceptor to destroyer). This still makes them relatively cheap given their battlefield potential but they are limited to a single unit of 15 models per army and I felt they bring a much needed unique benefit for the Nautican army. Giant Crabs - rule clarification for granite attack. Leviathan - increased armour save from 5+ to 4+. Made the Leviathan slightly more reliable. It will not go freal in turn 1. Increased pts cost from 370 to 380pts. Octopus Giganteus - corrected flee move from 3d6 to 2d6. Change -1 weapon skill to -1 to hit for enemies fighting through the ink mist. Slightly changed wording. Nautimo's Leviathan Vanquisher trident added - to hit and to wound modifiers and especially effective against enemies with the Large Target rule. Vial of Healing Sea Salts - added. Heals a single wound. Talons of the Father of Sea Eagles & Shell Horn - minor changes for clarification. Book of Malaise - reduced points from 65 to 55pts, slight wording change. The Bull Shark Banner - added, frenzy that is never lost. The Tsunami Wave banner - added, nullifies all enemy magic in base contact. Mermaid - clarified the "Peerless Beauty" rule with respect to missile units firing upon the mermaid and units immune to psychology being able to ignore the rule. Nautican Prince - clarification: speargun option is of Nautican type not fisher type. Clarified BSB rule and specified that BSB cannot be army general. Zheala - can only join units of Trident Guard, Wavebreakers or Tide Watchers. Regeneration save of 4+ for units that Zheala joins. Limited units Zheala can join. Coral Hunters - added "Safety in numbers" rule allowing units to combine. Crest Riders - changed limit on numbers of units that can be taken by army. The maximum allowable is now the same as the magic level of the most powerful Mermaid or Siren in the army. Crest Riders - Added "Safety in numbers" rule and it's effect on the Wave Breaker charge. * I am specifying a 25x25mm base size because I think most people will probably use Lizardmen Saurus models for Nautican Trident Guard units. This reduces their effectiveness and so needs to be taken into account in the points cost. Also, I have compared the Trident Guard with Chaos Warriors, Bloodletters, Dark Elf Black Guard of Naggarond and various other units and think I have over priced them in any case. added "Small Fry" rule - other Nauticans don't suffer panic if CRest Riders / Coral hunters get destroyed within 6^ or flee from combat or even if they flee through the Nautican unit. Added "Anarchistic" rule, cannot be joined by a character. * Vortex will be a magical water based entity with special powers to surround units engaged in combat with a "water whirpool". This will prevent units from fleeing (so first to flee, friend or foe, will be automatically "Caught" and destroyed). It might also prevent units from firing into combat (ie Skaven) and provide some sort of constraint on units joining a combat surrounded by the whirlpool. I'm still thinking it through. * Mariner Souls and the Ghost Wreck have been taken out of the main list but will make an appearance somewhere in the army, either as unit(s) attached to a bound item(s) or an "upgradable" option for a special character which can take either the Ghost Wreck or the Undead Mariner Souls into battle. * Too many people had said they did not fit well with the army. * the army books differ quite a bit in the cost of upgrading to musician, standard bearer and champion. Typically a "warrior" type of champion is double the points cost of a normal rank and file model. Standard bearers are usually the same cost as the champion and the musician upgrade is usually lower than the cost of a normal trooper. Note however, that there is wide variation in the books. For example, the older books such as Orcs and Goblins make all goblin command models more expensive than their rank of file counterparts. I have assumed this is because of the low cost of the goblins. Having gone through some of the books I have decided to treat Wave Breaker command model pts cost the same as Empire Spearmen because they share similar characteristics although they have to pay extra for the spear. * I thought it was probably unreasonable for them to be able to benefit form shields in addition to carrying a net and hand weapon. Crest Riders and Coral Hunters are a species nicknamed "Guppies" by the rest of the Nautican Army - a slightly derogatory term because they are thought to be weak, somewhat cowardly and therefore dispensable. Crest Riders added - to give the army a very limited "light cavalry" equivalent. Sandgangers and Ignimbrites - made use of doppleganger power optional at the beginning of each turn of combat, however, the whole unit must either use the power or not use it. note: I felt that the Haunting lilt was a utility spell (ie special purpose) that was not well suited to a default spell (ie the 1st in the spell list). I thought a more direct ranged attack spell would be more appropriate. This spell has precisely the same effect and casting value as the Gaze of Gork goblin spell. - Haunting Lilt become the default spell instead of Symbol of the Southern Seas (which is less useful and more of a "utility" spell). - Haunting Lilt casting power lowered from 6 ot 5. 17-Feb-09 21:15 gmt:- Over the next few days I will be updating the site with obvious grammatical, spelling mistakes and also changing some text to clarify rules. - Split Seaborn rules into 3 separate categories, "Breaking Wave", "Shoal Dispersal" and "Shoal Strength" dependent on which type of General the Nautican player chooses. - New rules only affect standard Nautican units with the Seaborn rule, not sea creatures. The Crystal Spear - removed. An item with similar properties called the Crystal Crown has been added to the Magic Armour section. I will make my decision this week so the army draft 2.0 will be completed by Sunday 14th December. Some changes which were noted in this change summary but I forgot to implement in the army list have now been made. - Overflight - reduced effectiveness by removing "cannot march move" from units that suffer a paralyzing attack from overflight. - Re-wrote harpoon rules. Removed the ability of the harpoon to fire into combat. Instead the harpoon can now be swung by 3 crewmen* to deliver a single str6 hit in close combat. The remaining crewmen fight as normal. - lots of rule clarification with regards to the "hook and reel"
most notably: "If a hooked unit is charged or otherwise engaged in combat it is assumed to have immediately freed itself from the hooks (in a desperate attempt to ready itself for the ensuing combat). A unit freeing itself in response to a charge cannot make a stand and shoot or flee reaction to the charge. " Changed reference to "ethnic Nautican units" to "Nautican units with the Seaborn rule"
Greatly simplified Zheal special rules - she now profers immunity to poison and a 6+ ward save on any unit she is part of, providing she is positioned in the front rank of the unit. Removed the requirement for Zheala to remain with a single unit for the whole battle. Enemies auto-hit the Guardian in close combat when he is using the throttle attack. - materialises anywhere within the Nautican army's deployment zone and within 6" of the Guardian. - anchor disappears for rest of battle if Guardian is destroyed or moves more than 12" away from it. note: several people have commented how this unit does not fit well with the army's underwater theme. However, there is a lot more Volcanic activity under the oceans then there has ever been on the surface world and, as such, I think the inclusion of Vulcanis is justified. significant changes have been made to the profile stat line to reflect the Lord level status of Vulcanis. - reduced range for units affected from 12" to 6"
- range limited to 24"
The Oceanic Trident - removed fear causing effect. Clam Machete - strength +1 in 1st round of each combat, armour piercing in 1st round of the very first combat that the unit is involved in. Some changes to wording which do not affect rules. Changes terrain allocation - Nauticans can choose all water terrain features. Kraken - considering making unit a "monster and handlers unit"
Sea Storm affects limited to all enemies within 18"
Kraken Shields - do not provide an armour save against weapons that ignore armour saves. Sandgangers - limited doppleganger ability to copy enemy model profiles, reduced points cost from 8 pts to 6 pts. Added regenerate on roll of 6. Added rule for fleeing Nautican units and water features. Will also make the mandatory Chanty Singer choice (to enable sea storms) a weaker than usual battle standard bearer hero to ensure there is an "opportunity cost" associated with the storm. Sandgangers can now also be harmed by war machines. The Trident weapon causes fear against cavalry, a Nautican does not cause fear and is subject to fear even if wielding a trident.